Hi Everyone, how was everyone’s St. Patrick’s Day? 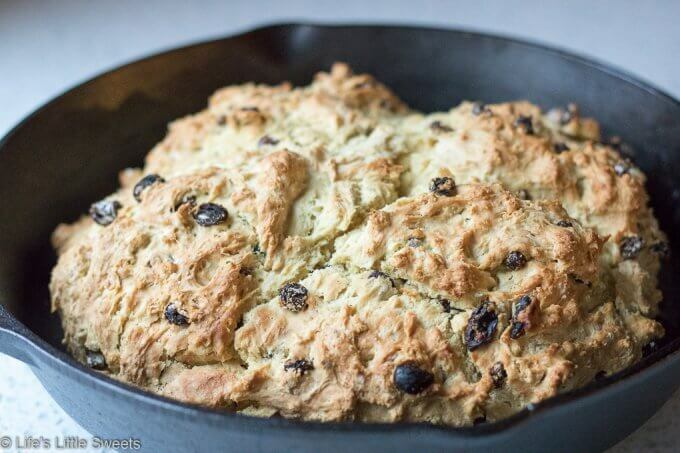 I have another St. Patrick’s Day, Irish-American recipe to share: Irish Soda Bread. 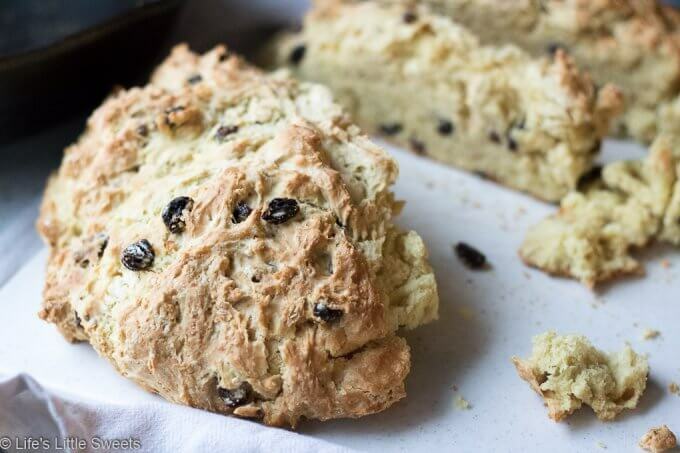 Irish Soda Bread was the first quick bread that I made on my own when I was a child. We had it every year at my paternal grandparents house around this time of year. I remember being fascinated by how Irish Soda Bread is pretty similar to a yeast bread, yet it is a quick bread. There’s no rising time to deal with which is makes it easy to make in under an hour. 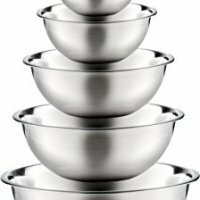 I have an interesting tidbit for you. 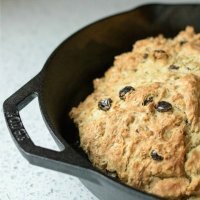 I recently assisted a Kathleen Sanderson cooking class at the Farm Cooking School and she said that in Ireland they would not put raisins in the soda bread and if they were, they would call it, “spotted dog,” indicating that it’s a fancy sort of bread. I always knew that the raisins in the soda bread was definitely an American thing, for American tastes but I never knew about the “spotted” dog name. To add the caraway seeds or to not add the caraway seeds? 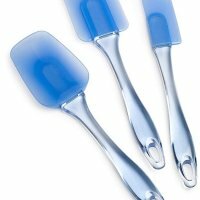 – that is the question! I’m making the caraway seeds optional in this particular recipe. Why? Because I feel that it is a totally different taste with versus without the caraway seeds. 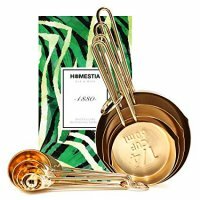 My husband Eric, does not like them (they are similar in taste to fennel or anise) – although he will eat Irish Soda Bread with caraway seeds begrudgingly, if it’s around and there’s nothing else to snack on. I personally LOVE the floral, more subtle and variate taste that they offer to the bread. It’s one of those personal preference things. Did you see my last Irish-American themed recipe, Corned Beef and Cabbage? 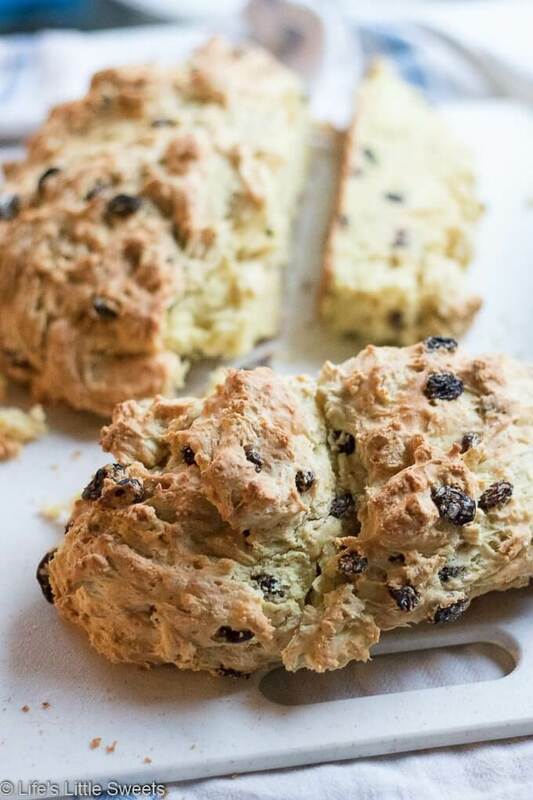 What Version of Irish Soda Bread is this? 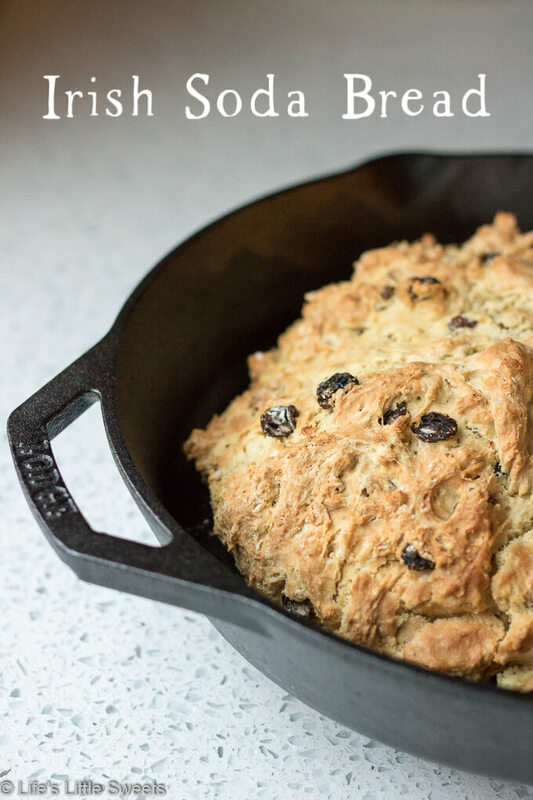 I love that this Irish Soda Bread is not overly sweet. 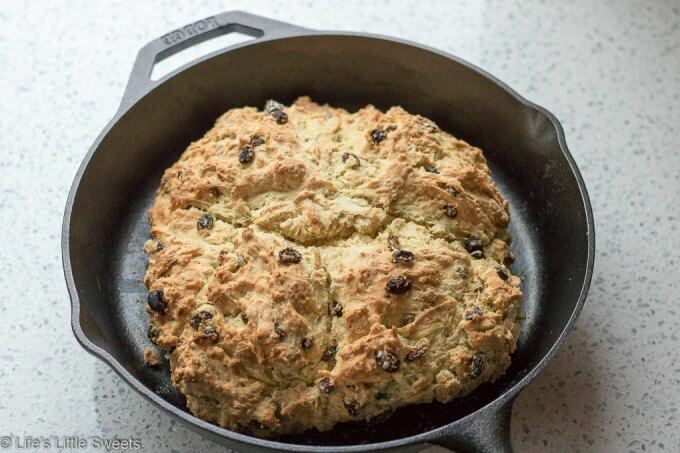 I am sure a more “dessert” Irish Soda Bread could be make and that would be an interesting recipe to develop for me, but this version, is more of a tradition, Irish-American, version, typical of what I would have had growing up in New England, in Massachusetts, in the Greater Boston Area. I would also like to share a more plain soda bread recipe, that’s more typical of what you would find in Ireland, luckily, I have plenty of family and friends that would know about this, so I will have to pick their brains about it and report back. 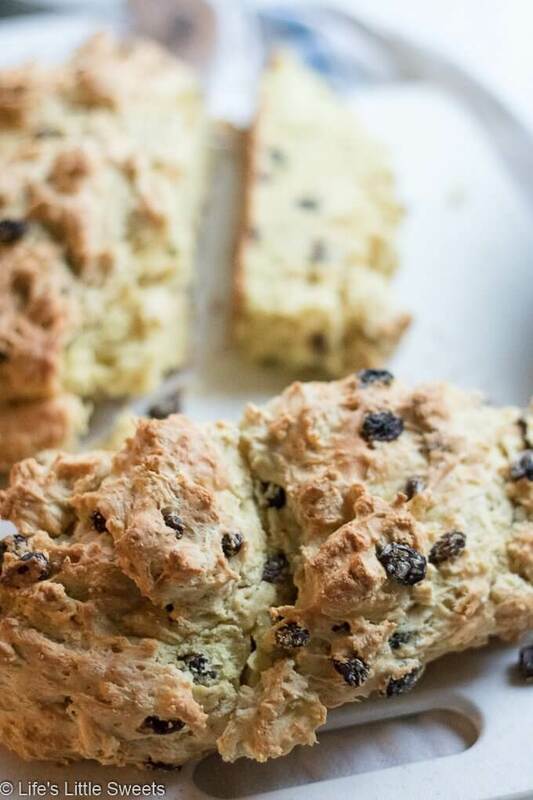 If you try this Irish Soda Bread recipe and love it, please rate it and share in the comments below. Thank you for reading and following along! 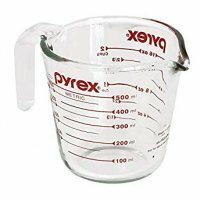 In a large mixing bowl, add the flour, sugar, salt and baking soda. 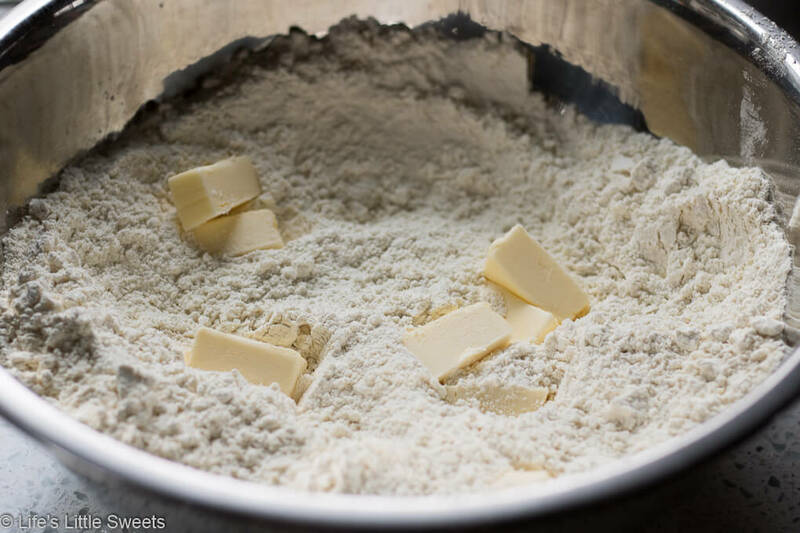 Add the butter pieces and using a pastry cutter, cut the butter into the flour. The texture should be course. 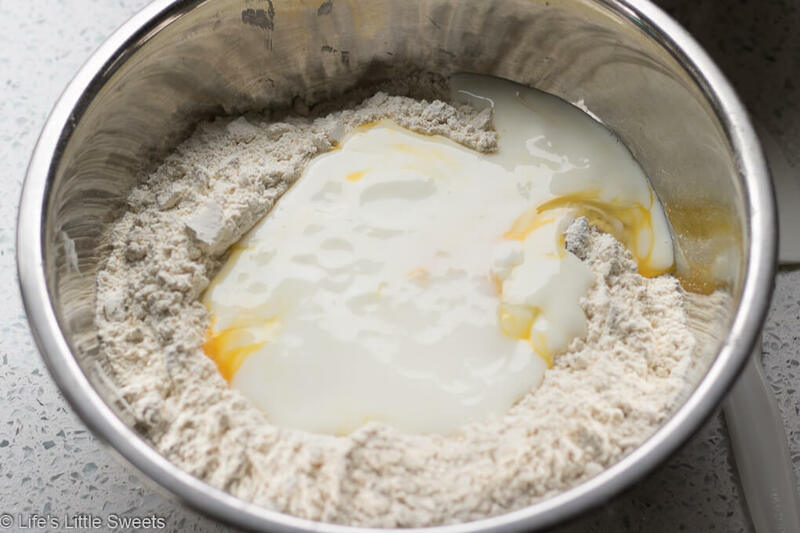 Make a well in the center, add the beaten egg and the buttermilk. 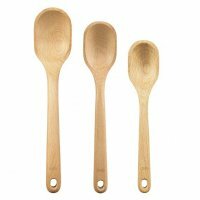 Using a stiff baking spatula or wooden spoon, mix the dough until just combined. Knead the dough until it forms a rough ball. 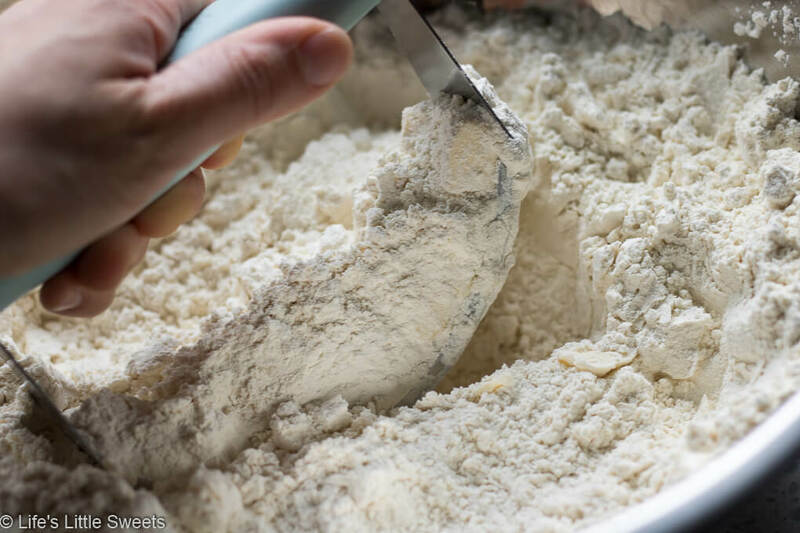 Use more flour if the dough is too sticky. Make sure not to over knead. 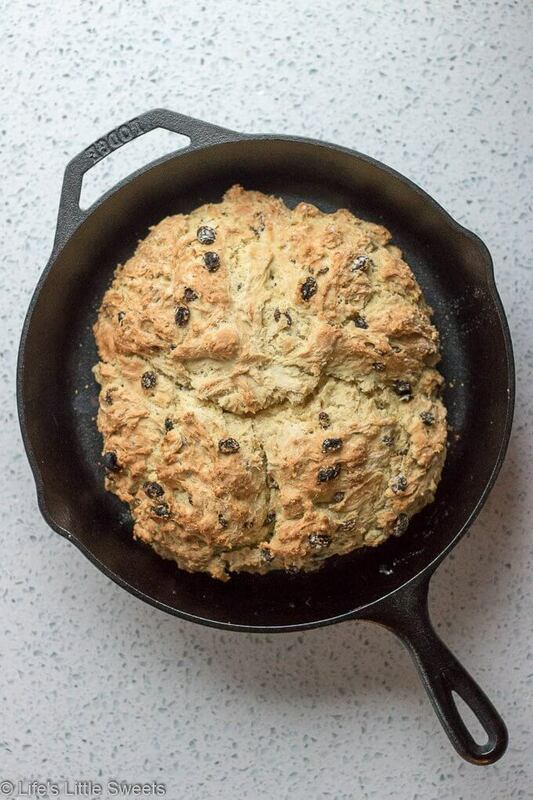 Put the ball of dough in a cast iron skillet. To avoid the bread sticking to the bottom of the pan, you can use parchment paper to line the skillet. 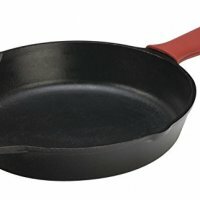 If your pan is well seasoned, you may not need the parchment paper. Score an "X" on the top of the dough ball. 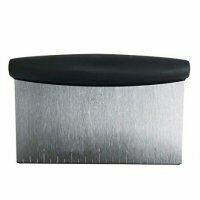 When the bread is done, test with a skewer, knife or toothpick, when inserted, it should come out clean. 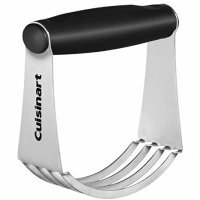 Slice, serve with jam and/ butter, if you wish, enjoy!